7-1/2" x 17" x 3/4"
The bottom half of your engine relies entirely on the engine oil for cooling. Keeping the oil in the correct temperature range prolongs the life of the oil, helping to keep internal engine parts within the factory tolerances while extending the life of the engine. 15503 is rated 4.0 out of 5 by 1. 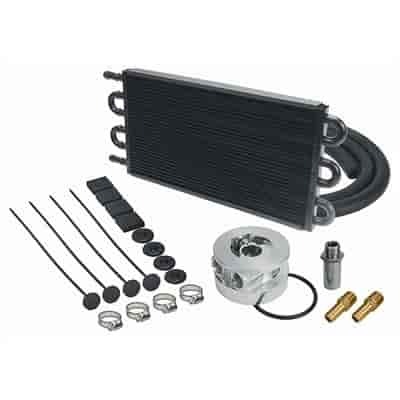 Rated 4 out of 5 by Nate dogg from Installed on 78 C60 dump truck I bought this oil cooler to help extend the life of my 350 chevy in my 78 Chevy C60 Dump Truck. It's a large truck & I had to rout the oil lines on the opposite side of the oil filter so the provided oil line came up short. Remember to shove the oil lines on the cooler b4 installing cooler or u may damage ur radiator. Also be careful I put a small hole in my radiator pulling out 1 of the cooler installation zip ties which made for a longer install. I did notice a more steady coolant temp after the install with a full load of rock pulling big hills. Will this product fit my 2010 Silverado 6.6l? Yes, this kit should fit you Silverado. Yes, this will it most GM applications.